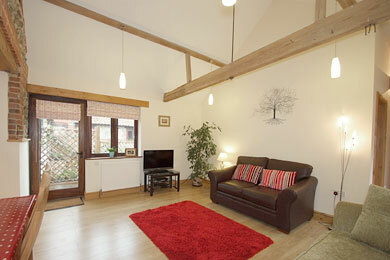 At Manor Farm you will be given a rare opportunity to live in a pigsty. Not any old pigsty, we hasten to add, and definitely not an absolute pigsty, but The Pigsty – perhaps the most luxurious cottage accommodation of its kind in the country! Three bedrooms. (The first bedroom, with king-size bed, has en-suite facilities, including bath and shower. The second offers a modern pine bunk bed and the third, a small bedroom with twin beds, is suitable for two children or one adult). It is now a while since The Pigsty was a cosy home for scores of delightful, squealing piglets. Some years ago plans for its conversion to a high-quality cottage were drawn up by a local architect. Soon afterwards conversion work began, carried out by two experienced craftsmen – a builder and a carpenter, both of whom were brought up and still live in the village. The result is a comfortable, light and airy building finished to an extremely high standard, with soft cream walls, wooden flooring and central heating throughout. As with The Tractor House and Cow Byre, features include glazed wall tiles, kitchen appliances (Cooker, Hob, Dishwasher and Microwave) by Bosch, heated stainless steel towel rails and a Sony television with Freeview and a DVD player. The cottage’s handmade furniture is by Kerri’s Pine of nearby Reepham. The overall result is accommodation that combines the convenience of the new with the charm of the old. Outside, a protected garden is popular with sun lovers and all who enjoy the great outdoors. Inside, books, children’s toys and DVDs have been provided.